Shochu, like sake, is all about the goodness of the grain or, in the case of Kagoshima's sweet potato shochu, the goodness of the tuber. 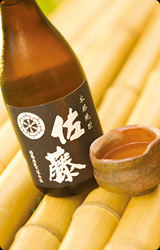 The finest shochus are much like Irish whiskies, though even lighter and with a lower alcohol content. Those made by traditional family-owned distilleries are known as "honkaku shochu" to distinguish them from mass-produced labels.